1. Score Tranquil Tide at 2 ½” & 6 ½”. Fold along score lines. 2. Round corners of top flap & coordinating DSP. 3. 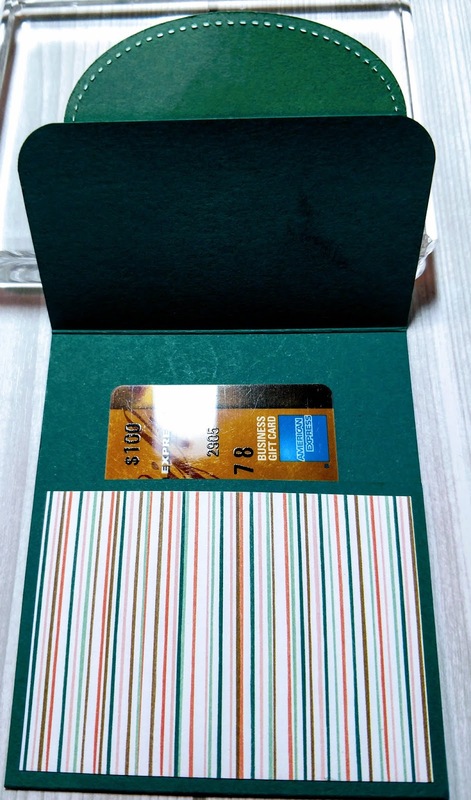 Apply Tear & Tape to bottom flap (2 ½” flap) & fold to make area to hold Gift Card. 4. Glue DSP on to front flaps. 5. Cut out Mint Macaron oval using Stitched Shapes then glue onto upper flap as shown. 6. 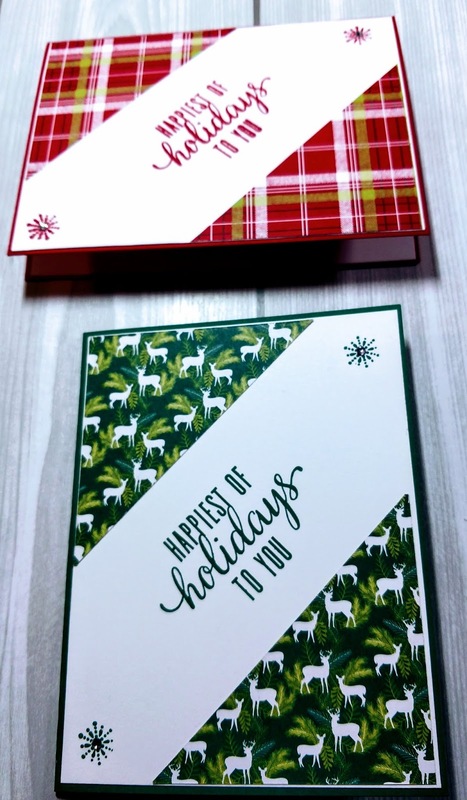 Stamp sentiment onto Whisper White scrap & punch out with Tailored Tag Punch. 7. Pop up sentiment using Dimensionals. 8. Stick on some Facet Dots to give it that extra pop. 9. Add Velcro dot for closure. Host Code: RQCXNNKB to receive a free package of Facet Dots. Sign up for my newsletter and get 10% off of one item in my Online Store! Schedule one today with you and your friends! I’ll bring the fun, and you bring the people. 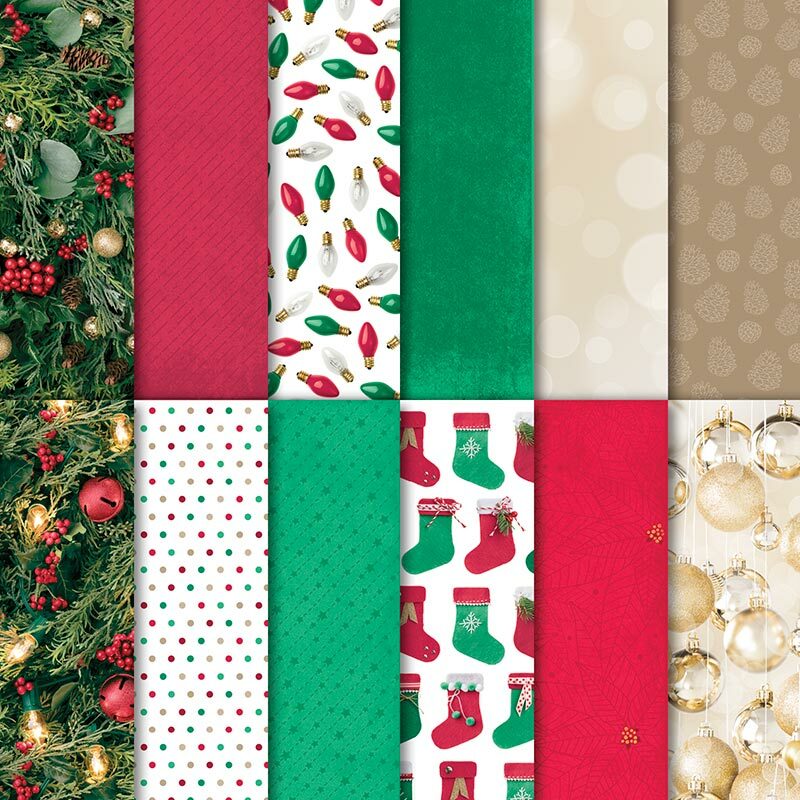 with friends and create our Christmas cards together! ahead of our Christmas Projects! great night of entertainment for your friends! 4 custom cards for $15.00 or Free with a min. order. 1. Cut card base 4 1/4" x 8 1/2"
2. Cut designer series paper 6" x 6", then cut that piece into (4) 3" pieces. Cut 3" piece in half diagonally. 3. Cut whisper white card stock 4 1/8" x 5 3/8"
4. Stamp sentiment and image on whisper white using a sentiment of your choice. 5. Attach DSP to whisper white piece as shown in the picture using snail adhesive. 6. 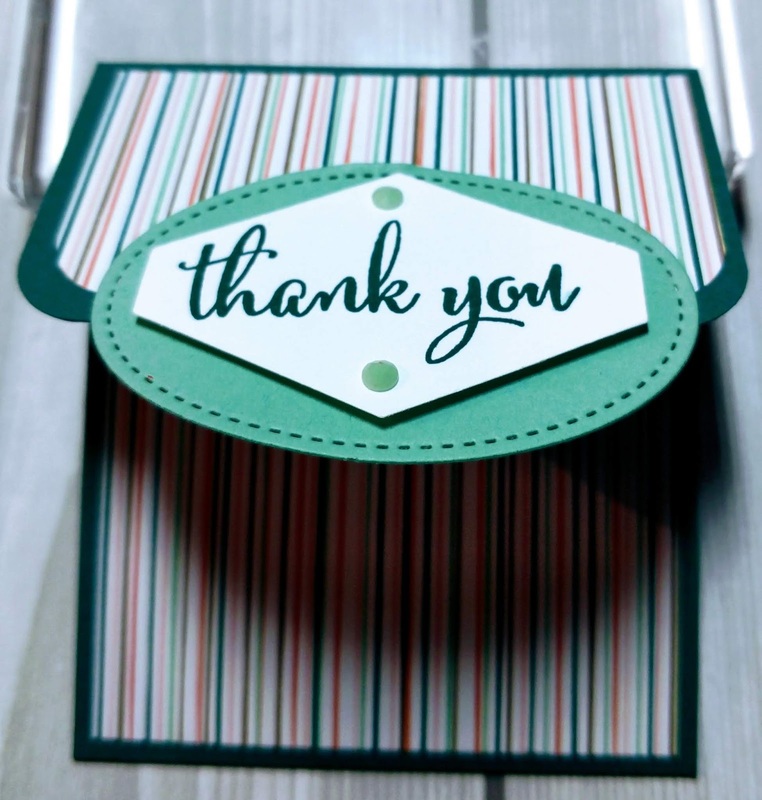 Attach whisper white layer to card base using snail adhesive. 7. Add clear rhinestone to give your card that extra pop! 8. Viola your card is complete. Thursday Treasure: Stampin' Up "Life is Sweeter"
Stampin' Up! 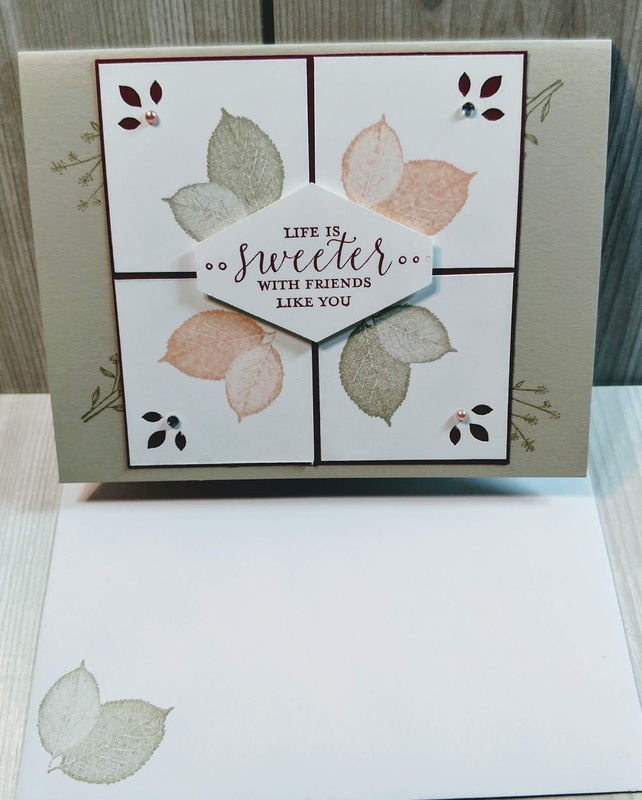 Life is Sweeter featuring "Detailed With Love"
Our team's weekly challenge was to create a project using the colors Merry Merlot, Petal Pink and Sahara Sand. The Merry Merlot and Petal Pink are two of the new colors. I really love how these colors complement each other. I chose to use the Healing Hugs stamp set because I want some leaves and foliage on this card. 1. Cut sahara sand card stock 8 1/2" x 11", score @5 1/2"
2. Cut merry merlot card stock 4" x 4"
4. Stamp leaf image on 1 3/4" x 1 3/4" whisper white using each ink pad. 5. Cut edges using the detailed trio punch. 6. Stamp foliage image on the card base using the tone on tone stamping technique. 7. Stamp the sentiment on the whisper scrap and cut using the tailored tag punch. 8. 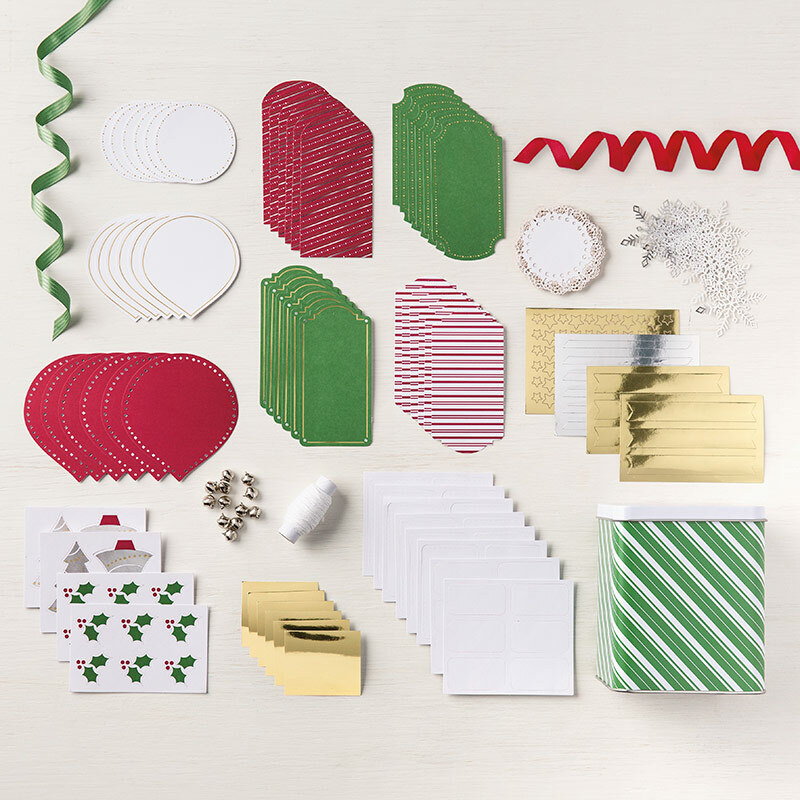 Attach whisper white squares to merry merlot card stock square using snail adhesive. 9. Attach first layer to card base using snail adhesive. 10. Add sentiment label using dimensionals. Embellish whisper white squares with pearls and jewels. Voila your card is complete. Create coordinating envelope for that extra pop. Host Code: RQCXNNKB to receive your free gift from me. 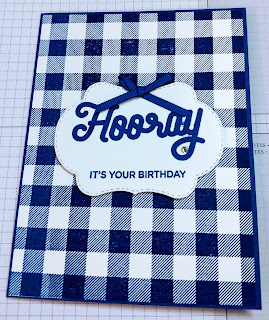 Product of the Week: Stampin' Up "Hooray it's Your Birthday"
I created this cute card using the "Buffalo Check" stamp set as my background. 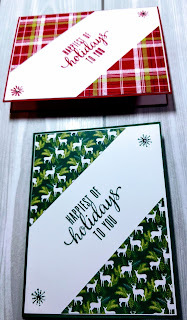 I've always loved the gingham design and was so happy to see this new background stamp set in the holiday catalog. The very first time I had an opportunity to use this design was in the July 2018 Paper Pumpkin kit " Picnic Paradise". The gingham designer series paper was so adorable. This was my first attempt using this stamp set but I think it's just super cute. 1. Cut blueberry bushel card stock 4 1/4" x 8 1/2"
2. Cut whisper white card stock 4 1/4" x 5 1/2"
3. Stamp background image on whisper white using the stamparatus. 4. 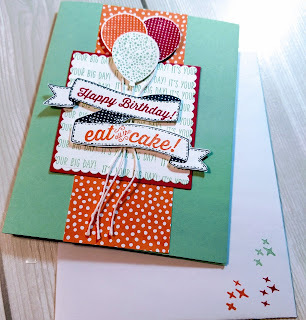 Stamp sentiment on whisper white label using the Broadway Birthday stamp set. 5. 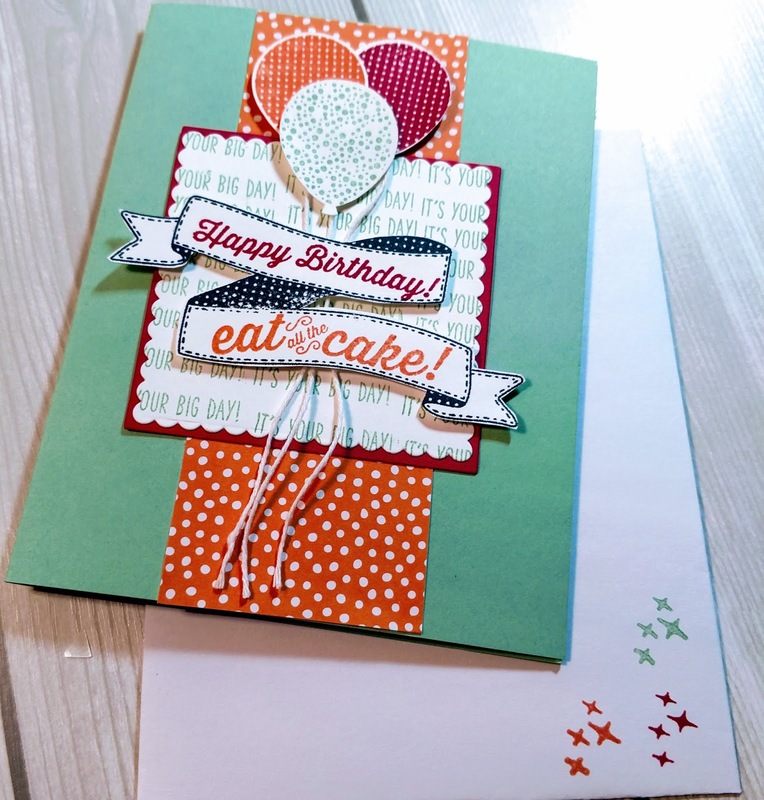 Attach background layer to card base using snail adhesive. 6. To give your sentiment a raised look attach it using dimensionals. 7. Add ribbon and clear rhinestone to give your card that extra pop! Our team's weekly challenge was to create a birthday card. I Cased this card from the Stampin' Up! annual catalog page 73. I've had this stamp set for a while and this year I promised myself to use each stamp set at least once. I wanted my project to have several layers and this cute card was perfect. 1. Cut mint macaron card stock 4 1/4" x 8 1/2"
2. Cut whisper white card stock 3" x 3" & 4" x 8"
3. Cut lovely lipstick card stock 3" x 3"
4. Cut grapefruit grove dsp 2" x 5 1/4"
5. Stamp banner, sentiment, and 3 different colored balloons on larger piece of whisper white. 6. Stamp sentiment on small piece of whisper white to create background. 8. Cut sentiment banner using the bunch of banner framelits. Punch balloons using the balloon bouquet punch. 9. Attach the dsp and square layer to the card base using the snail adhesive. 10. Attach balloons, twine and sentiment banner using dimensionals. 11. Viola your card is complete. 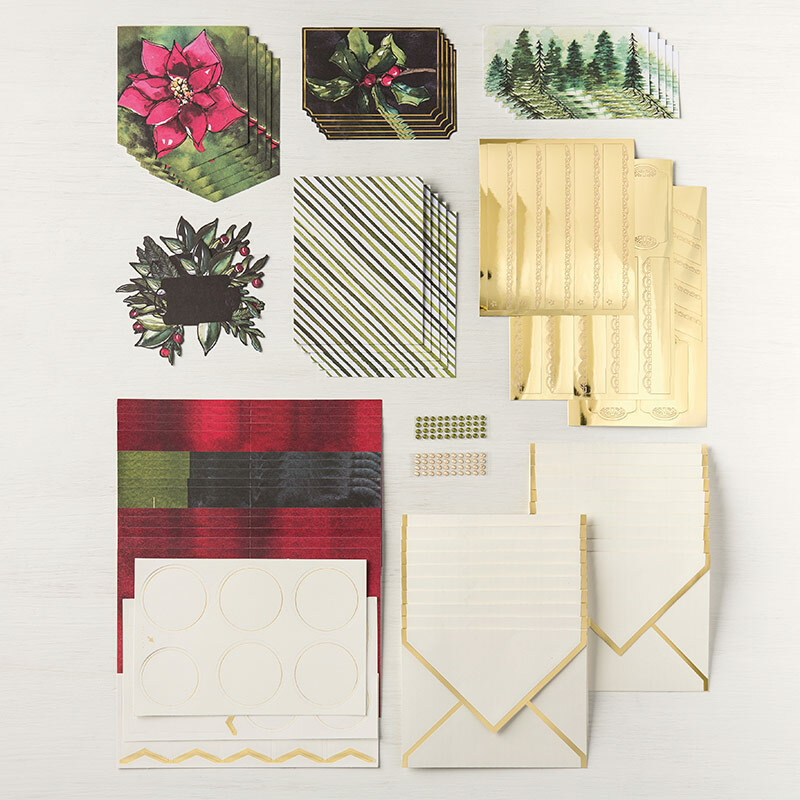 Decorate envelope to give your project that extra pizzazz.